To my mind, ‘Kill The Moon’ turned out to be another good episode. If I could compare it to a past Doctor – and it feels like the series currently demands that of you – it would probably be the Fourth Doctor, dear old Tom Baker. When the Doctor disappears into the crack in the Moon seeking out the source of the spiders, that reminded me of Tom for some reason. Not quite sure why. I’m happy to go with the gut instinct on this one. 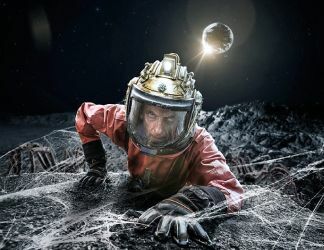 So, in ‘Kill The Moon’ we have a humanity-changing situation at hand in a point of temporal flux of which The Doctor has no notion of the outcome. What happens now hasn’t happened yet – despite the fact that what has come after apparently already has. Clara has seen the Moon in the future, so how could it possibly be destroyed in the past? Anyway – we have had these temporal nexus points before. Going back to Tom, ‘Genesis of the Daleks‘ was a nexus in some measure. The Time Lords sent him to destroy the Daleks – and the point of their creation by Davros represented a malleable event open to change. We seem to have two phenomenon that have cropped up many times like this – the nexus, where events could be changed despite the certainty they can’t be open to alteration; and, the forgotten past, where something happens – like a Tyrannosaurus Rex or a gigantic Cyberman – and people somehow paper over the incident like it never did happen. Who remembers it – um… no one, because it would hurt to give it credance, and it was probably just the fog or a minor outbreak of hysteria. Here, The Doctor takes the stance he has worked against for so very long. The Time Lords claimed they held to values about non-intervention, and only the Doctor and a few others – like the Celestial Intervention Agency – worked against the grain. Here, The Doctor steps back and states he can have nothing to do with the decision. The only people able to make this decision has to be those affected by the outcome, the people of Earth. For Captain Lundvik, there isn’t a choice. The Earth must survive. Her future collapsed because of this change in the Moon, her prospects in space exploration extinguished. A selfish point of view, for certain – but, the natural one, perhaps. When The Doctor discovers the truth about the Moon and what it represents, the needs of the many outweigh the needs of the one. Especially when you have no idea about the intentions or the appetites of the one. On the other hand, Clara and Courtney have a different view. Clara seeks to open the question up to the whole world with her broadcast to mankind. In the end, the people of Earth give in to the base fear of non-existence – how can you risk saving one unknowable thing? I liked the spiders. They creeped me out and they provided a savage distraction from the core tale. In the end, this episode was there to remind us – and Clara – that the Time Lord isn’t human and Earth isn’t his home. To travel with the Doctor means to face danger and to play with the lives of others like it’s just a puzzle or a game. Danny Pink has a more down to Earth and commonsense view that you can’t play games like that. You need to embrace what you have in front of you – adventure isn’t worth the risk. He can see, however, that despite Clara’s anger at the Doctor for his behaviour, she isn’t ready to give up that excitement. The peril might scare her, but it also provides an edge she craves – like an antidote to the boredom of her existence as a teacher. In the midst of this tale, we also have a deeper, darker level of discussion about extinguishing life. On a very adult level, we consider genocide and abortion – ending life of a creature that might be the last of its kind; ending the life of a creature not yet born, unable to make a choice itself. Several episodes have mentioned the last of their kind and this constantly links back to The Doctor. The genocide question again links to the likes of the Daleks and the decisions we sometimes make that go against the grain of our belief – does not doing something have as many impacts as ending it. The Fourth Doctor didn’t eliminate the Daleks because of the strength and cooperation that would come from fighting against them. The science – yeah, the science doesn’t stand up to scrutiny. However, if you scrutinize every episode you will always find fault, even in the very best and most satisfying. In the end, ‘Kill The Moon’ worked for me. I enjoyed the dynamics. I liked the spiders. This entry was posted in Current Doctor, Review and tagged Celestial Intervention Agency, Clara Oswald, Moon, Time Lord, Tom Baker on October 29, 2014 by Paul B.